It dawned on me that what I put on my skin is just as important and what I put into my body and for the most part a lot of the beauty products I have in my bathroom probably should be tossed out. Recently I ran out of facial wash perhaps instead of running to the store to pick up a new bottle I should try to make my own cleansers for my face instead. I have seen tons of diy scrubs and masks on Pinterest before and thought I would make my own. I decided on this fruit and yogurt one because I already had all the ingredients in my fridge. Jessica was a little confused when I was making it- she thought she was getting a smoothie and then saw me rubbing it all over my face in the bathroom. I did end up making her a smoothie right after so I wouldn’t seem like a complete loon to her. The mask was cool and tingly on my face when I put it on. It felt great. After I washed it off my skin felt super, super smooth. Pretty sure I will try this one again, and again and again. 1. In a blender add 2 Tbsp of honey and 2 Tbsp of yogurt and blend until smooth. 2. Add 1.4 cup of berries. (blackberries, blueberries, raspberries, strawberries whatever you have kicking in the fridge will do!)Blend. 3. Add 1 Tbsp of freshly squeezed lemon juice. blend. 4. Cover face with mixture and leave on for 10-15 minutes. 5. Remove with warm water and a soft face cloth. Honey is a mild antiseptic and will gently exfoliate your skin while locking in moisture. Lemon juice is chalked full of vitamin C and its natural enzymes help brighten the skin. Blackberries are full of antioxidants and will keep your skin looking young and fresh. Use this mask weekly to knock off dead skin cells and rejuvenate the skin. « 5 simple ways moms can squeeze in exercise. Never done it but def going to try it! Maybe with defrosted frozen fruit. I have been meaning to try and make my own fresh fruit mask so maybe now is the time. I like the idea of using honey as it already has so many beneficial properties! This sounds great. I’d love to try a fruit mask. 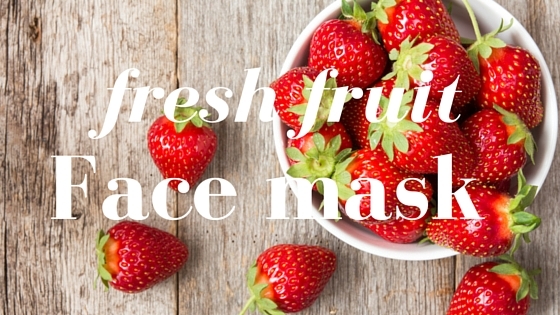 I would love to try this fresh fruit face mask. My skin is so dry with all of the recent weather changes and I could really use the moisture. this looks so luxurious. this would be perfect for a girls day. maybe sip a little champagne while wearing this. I’ve heard a lot about using honey as a face mask, but never tried it. Glad I have a recipe to make my own now! Now I wonder if I’ll be able to make this without first eating the fruits. I’ve never made my own but I actually have all those ingredients right here too. I might make this over the weekend and give it a try. This looks amazing! I am going to have to try it this weekend! Sounds amazing! I have never made my own face mask. May definitely try this! This sounds (and I’m sure, smells) so refreshing! I’d be worried the darker berries might stain my skin, but the idea of using strawberries is very appealing. They will be in season soon! looks really good. will be printing and saving to my recipes to make soon. I love anything with bolognese sauce so this sounds very interesting. looking forward to see the results on my face. all that is homemade is better. This sounds great, I have never tried a face mask before. I’m not sure if I could resist eating it long enough to put it on my face. I often use a honey mask and I use 100% coconut oil as a daily moistureizer (try it!). I’ll have to give this a try! I really need to try a fresh fruit face mask! What a fun at-home spa day that would be. This sounds amazing! I make a lot of my own beauty products and cleaning products. I have yet to try a homemade mask but since I have all the ingredients on hand…. I’m off to make it now! I’m sure my girls will think I’m totally crazy too! I don’t know why, but I have never considered a fruit and yogurt face mask! It sounds incredible, although, I don’t know how I would stop myself from licking it, LOL! This sounds amazing! It is a multi-purpose thing because you can eat it and use it to keep your skin gorgeous! I have started doing everything “naturally” in the past year or two and stopped using face masks completely. This idea sounds wonderful and I cannot wait to try it! It makes me think of the face mask on Mrs. Doubtfire haha! Sounds really nice, I bet this makes skin soft and smelling great! Also sounds good enough to eat! I love DIY beauty masks. I want to try this for a weekend refresher. Ooh, I’m definitely going to try this. I bet it smells delicious! Although I like the strawberry and honey mix in a face mask, I am not sure about the lemon. I know it is an astringent but my skin is really sensitive. Shelly, I thought so too at first as I have sensitive skin myself but it worked out like a charm! It had a tingly feeling like I used a medicated facial cleanser but it didn’t hurt and I wasn’t left with a red face either. I need to try this. I really like that honey is in it too – so many benefits for you skin – it’s antimicrobial! I had no idea this was possible! I am totally going to try a mask like this!! I can’t wait to try it! The hard thing will that control myself not to eat it!!! This sounds good for the face — and delicious, too! I’ve never tried a fruit mask, this sounds intriguing! I’ve done the same basic recipe with cucumber and avocado but I’ve never done it with berries. I’ll have to give it a try. I have yet to make my own face mask, but oh my this sounds amazing! Only problem is that I will want to lick it off my face 😉 I think it is about time I treated myself to a nice hold made mask. Thanks for the recipe! Good on you! I see those on Pinterest, etc. but I’ve never done it. I love that it is with things I already have! I not only want to make and try this but I bet if it falls into your mouth it taste great. Much better then store bought ones for sure. Exactly! Made with ingredients you already have in your fridge that are all natural and healthy. Not to mention things you can actually pronounce. Gorgeous. I love a good smelling and good feeling mask. I did one similar the other day before a wedding. So pampering! I want to make this. It bet my face will smell awesome all day long, too!